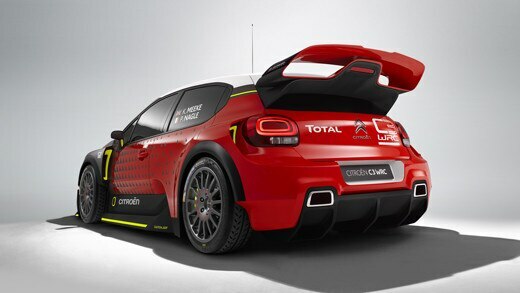 On the occasion of the Paris Motor Show, Citroën reveals the world premiere C3 WRC concept, a sporty and muscular version of Citroën C3, which will meet the challenge of ensuring the return of the Citroën Racing Team in the FIA World Rally Championship. C3 WRC concept retains the roundness, freshness and stylistic elements of C3: two-level light signature, two-tone body/roof and accents matching the colours of the roof. A dark bumper and chrome chevrons stretching to the daytime running LEDs, carbon yellow racing mirror and a 55mm larger chassis than C3 allows greater aerodynamic freedom and a spoiler for the front bumper is equipped to enhance this... A sporty design and sharpened tone. - Enlarging the diameter of the turbo flange to 36mm has led to engine power increasing to around 380bhp.